There is something magical about Back to School. I know the world at large views New Year’s Eve as a time for reflection, resolution making, and a plan for starting over, but ever since that first taste of back-to-school shopping at the start of first grade, I’ve been hooked. I had my hunter green, smocked bodice dress with the inexplicable Strawberry Shortcake brooch fastened tight, blue plastic Peanut Gang lunchbox safely tucked inside my no-nonsense purple backpack, and I was ready for all the year would bring. I held my head up high, rounded the corner, and marched right through the brick red double-doors toward inevitable success. Coupled with my word nerdery, it’s no wonder I became a teacher. I adored setting up my classroom, organizing the folders, binders, reading stations, art supplies, you name it. I maxed out every supply budget allowed. I ordered posters from the Library of Congress with reckless abandon. Every year, it was a fresh start. A new beginning. New kids, new classes, new parents, new books, new, new, new. The possibilities were ENDLESS. Should’ve stuck with Harrison Ford. Whatcha gonna do. A new year is beginning, and while I am home with my babies instead of outfitting my trapper keeper or designing seating charts, I am feeling this fresh start. I’m ready to accomplish all the things. I can feel my heart racing in anticipation of the endless possibilities. And maybe I should ease up on the coffee. that was a bit of a downer. 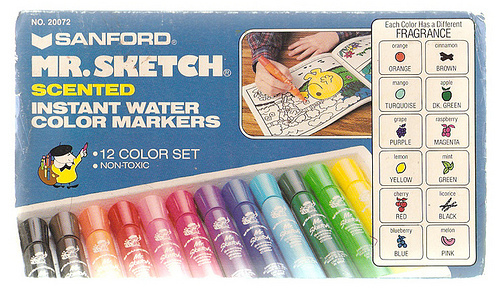 It still have those scented markers in the pantry. I’ll stick around. I’ve always (facebook) liked your voice and your narrative. Interesting and complex. Thank you so much, Harlan!